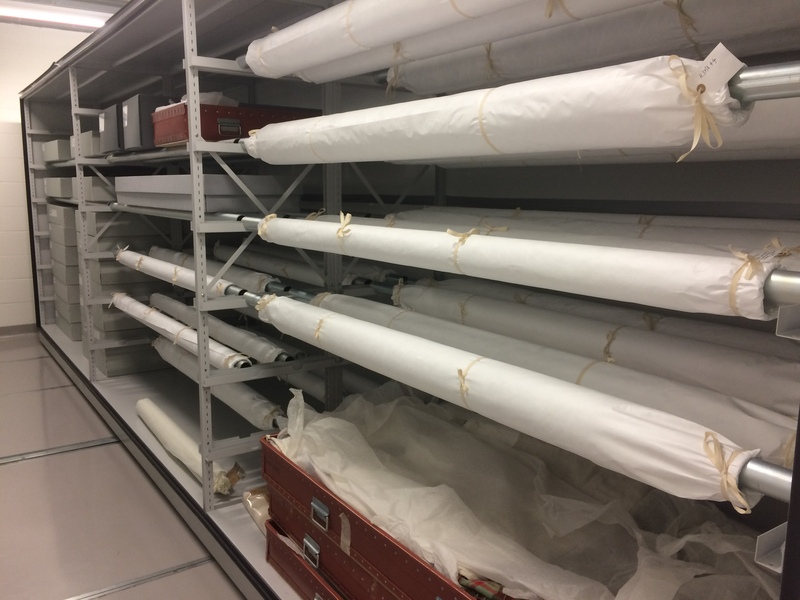 Sensitive to light, moisture, over-handling and pest damage, textiles are amongst the most fragile objects in the national collection. So what’s the best way to store them? When it comes to large flat textiles, rolling them is best. The textile stores are bursting with rolled textiles and textiles waiting patiently to be rolled. But surprisingly many of them are simply plain white lace or linen. 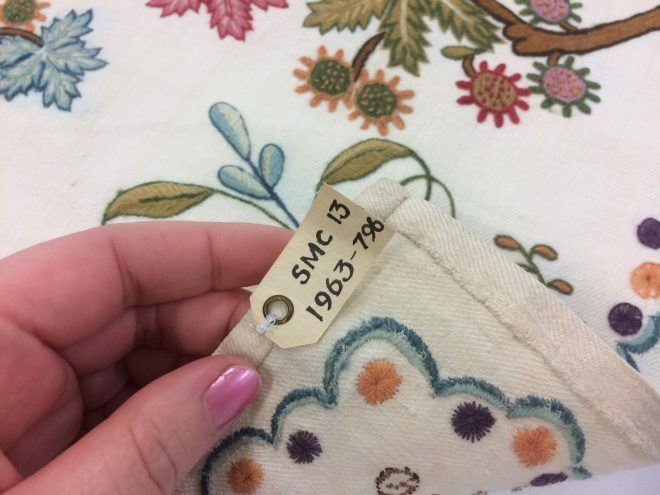 So when a colourful, embroidered specimen comes along, it’s a real treat for our assistant textile curators Emily Taylor and Lisa Mason (aka the rolling masters). The textile stores are bursting with rolled textiles. 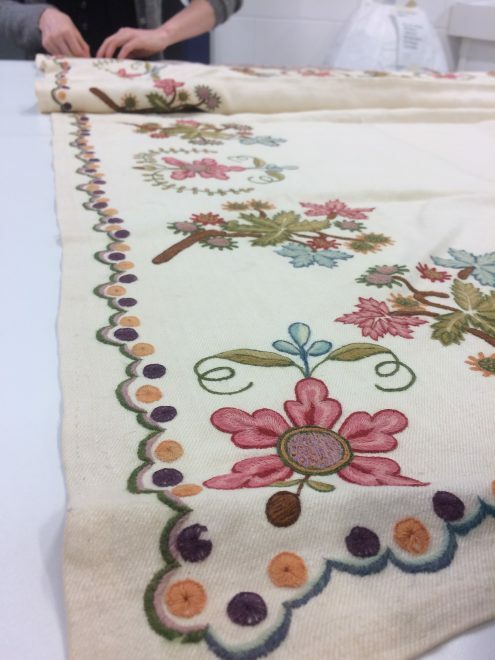 Knowing my love of everything floral, they invited me to roll this florally embroidered bedcover with them and see the rolling process first hand. 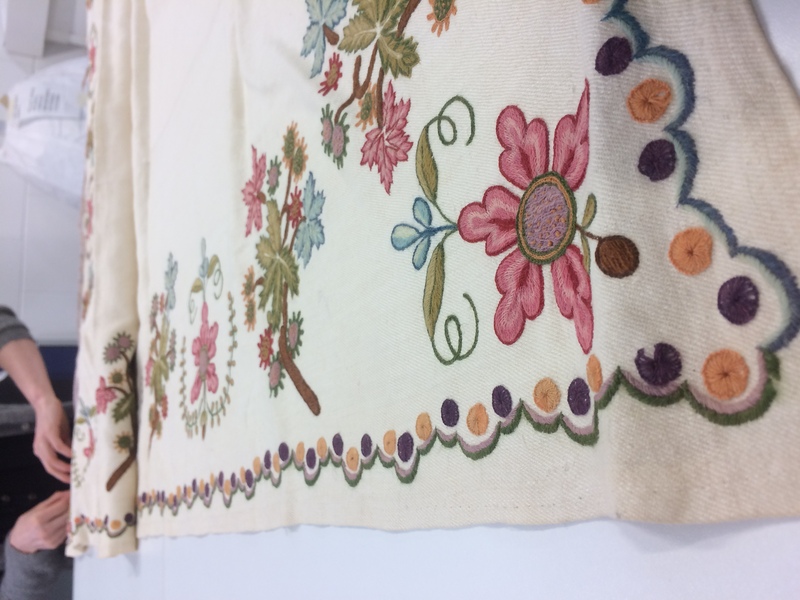 Described in the records as a ‘white twilled linen and wool bedcover, embroidered with floral design at edges and centre in multi-coloured wool’ this textile (object number H.SMC 13) is said to have been made on Scalpa, off the Isle of Skye, by Margaret Macdonald and her four sisters c.1780-1830. Step 1. The accession number is checked and re-written if necessary. Step 2. 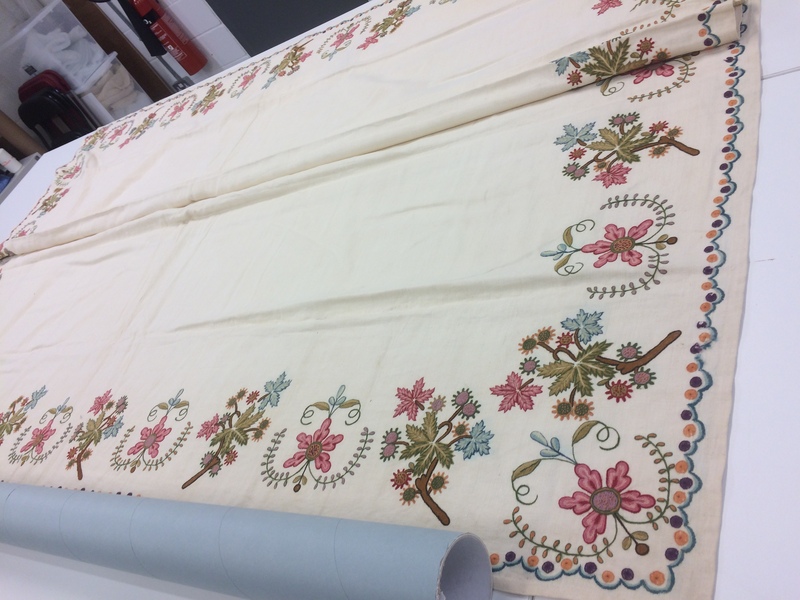 The textile is laid out and a suitably sized acid-free storage tube is chosen and adjusted as necessary. Step 3. 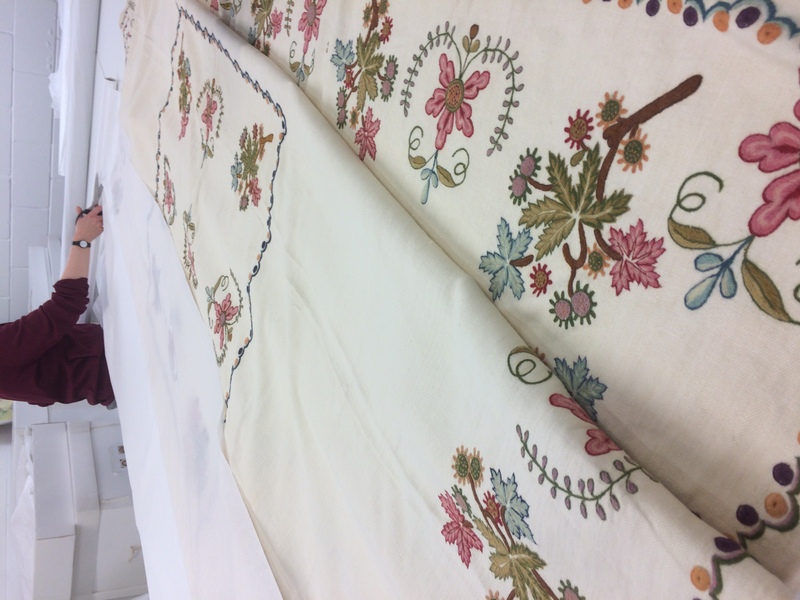 The textile is measured, documented and inspected for any imperfections, especially damage caused by pests such as moths. Step 4. Acid-free tissue paper is cut to size then put underneath and on top of the textile to provide protection and padding. Step 5. 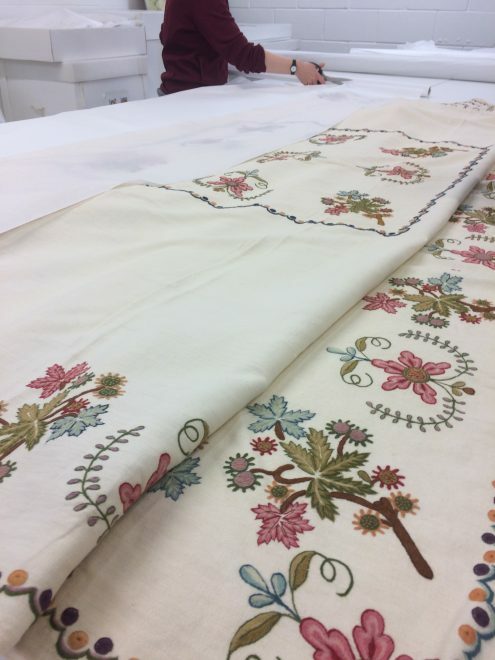 The textile is then rolled slowly around the tube with the creases being smoothed out and edges realigned. Step 6. 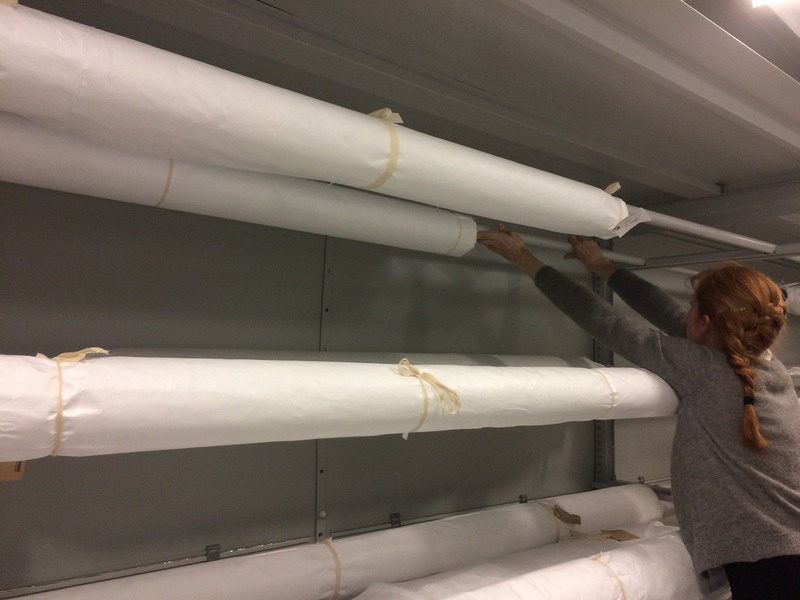 Finally, the textile is rolled in more acid-free tissue paper before being wrapped up neatly with Tyvek® (a polyethene fabric that protects from dust), then labelled and stored. 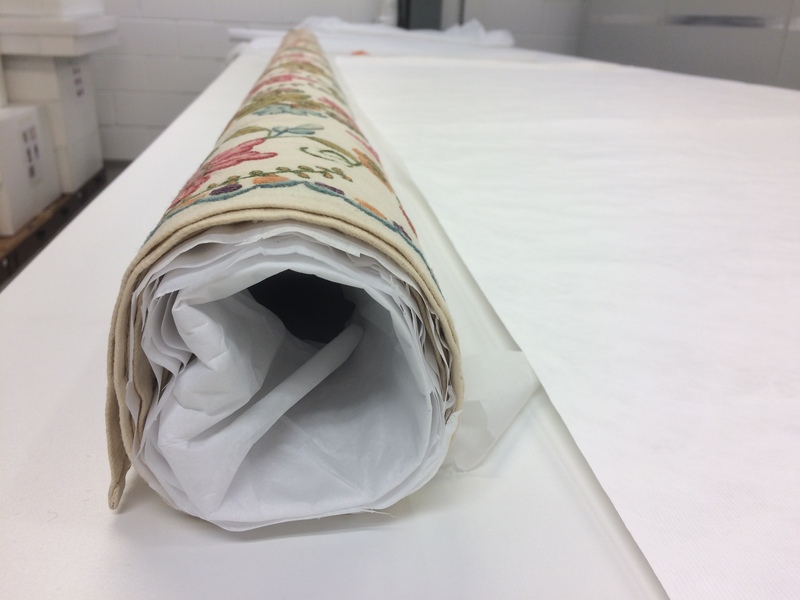 By rolling large textiles like this, they become physically more manageable and are kept from being over-handled. Rolling also provides an even distribution of the weight and allows for creases to be smoothed out. This process gives the textiles the very best chance of survival so that future generations can enjoy and learn from them.